On a city roofdeck, the same birdbath works in summer, and heated in winter. items in your backyard year round is clean, fresh water. 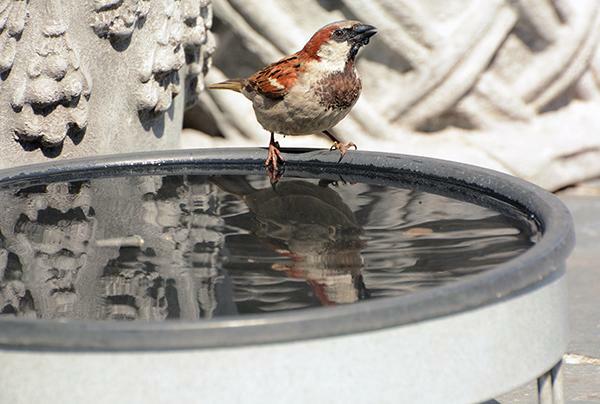 When its really hot, birds are regularly in need of hydration, the ability to cool down and clean their feathers. But fresh, clean water isn’t always available. The water in your street, or in lawn puddles, even after a big storm, might not be just rainwater. Chemicals from neighbors lawns run off into it, plus oils and toxins from the road and driveways, and the list continues. Putting out a birdbath and keeping it clean and filled with water will ensure the birds in your area make a beeline for your yard in summer. Your water source doesn’t have to be complicated or expensive, but a little creativity goes a long way. A shallow dish with about 1″ of water in it, is perfect. It needs to be deep enough for birds to take a bath, but not too deep for smaller birds to wade into it. If your dish is a little too deep, put a flat rock in it which rises out of the water so that smaller birds can perch safely on that to get a drink. You don’t need much space for a birdbath, and even if you are in the city, if you have a small garden, you can put water out. If you have dripper irrigation, you can use a dripper to keep the birdbath filled, which is what I do in the city. Just make sure it’s in a safe spot for birds to bathe and drink without fear of predators. Off the ground is best secured on a post or clamped tightly to hang it off a porch railing. 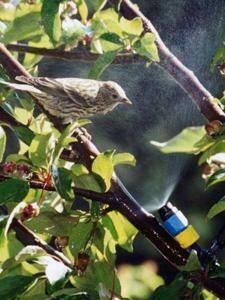 Want to really up the ante and attract hummingbirds with water? Try a mister. Hummingbirds love being misted in hot weather and will happily visit your yard for this special summer spa treat. You will also find the mister to be attractive to all kinds of birds, and that makes sense as misting is sort of like running through the sprinkler when you were a kid. We can all remember how much fun that was and how wonderfully wet and cool we got doing it. What a great treat to offer the birds in your yard!